Here you can find all info about Amnesia Haze from Zativo. 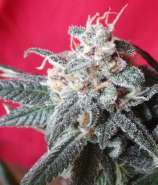 If you are searching for information about Amnesia Haze from Zativo, check out our Basic Infos, Lineage / Genealogy or Hybrids / Crossbreeds for this cannabis variety here at this page and follow the links to get even more information - or list all Amnesia Haze Strains (±47) to find a different version. If you have any personal experiences with growing or consuming this cannabis variety, please use the upload links to add them to the database! Amnesia Haze is a mostly sativa variety from Zativo and can be cultivated indoors (where the plants will need a flowering time of ±88 days) and outdoors. Zativos Amnesia Haze is/was only available as feminized seeds. Amnesia Haze has a reputation for having on of the most potent psychedelic highs around. It is certainly one of the most potent of our catalog. Created by combining Amnesia x Haze, this strain has a flowering time of 12-13 weeks and offers up a generous yield. Amnesia Haze is an award winning, sativa dominant strain. It is well known for its strong psychedelic high, stunning sativa appearance and its beautiful, pungent aroma. This is a top shelf strain and should be treated with the according respect! Originating from Holland, the two great strains, Amnesia and Haze were combined into one mighty plant. As when any legend is born, the coffee shops in Amsterdam hailed it as an all time favorite. It has held a lot of influence and still does to this day, still remaining on the menu of many a coffee shop out there. You can expect quite a treat when you come to smoke this. You will be hit with a fruity, floral explosion that is extremely pleasing to the senses. It is a smooth smoke that will induce a predominantly cerebral high, uplifting and energizing your mind. You will find yourself swept over with a wave of euphoria and deeper understanding - it is an experience to remember and a great conversation aid when smoking with friends. Amnesia Haze has a very potent kick to it, as the name suggests, if you have too much it has the capacity to turn off your brain for a while – novice smokers beware, take your time here. Medical users will find that it helps with stress, anxiety and depression. It can also reduce pain through the traits of its indica heritage, but it is not the main focus of the strain. Amnesia Haze is a great grower, it is mainly suited to indoor or greenhouse growth, but should you live in a hotter climate such as California or Spain then Amnesia Haze will be fine outdoors. It can reach up to heights of 1.2m indoors and requires a lengthy 12-13 weeks to flower. This is a very long time, a time that will probably put of commercial growers; but if you can stick it out you will be rewarded with a large amount of some seriously high quality bud – it is well worth it. You can expect a yield in the region of 600g/m2 for your time and effort. If you grow this outdoors, you can get up to 1500g per plant (!) under optimal conditions, she can be quite sensitive to pests and weather though, so be careful. Amnesia Haze is held with such high regard for a reason. It is a real connoisseur strain that rewards you for your time and effort. Its like anything in life, you get out what you put in, and if you pour yourself into this beauty she will pay you back tenfold. If you are in the market for a legendary sativa hybrid then you may want to give these Amnesia Haze seeds a go. Do you know something more about Zativos Amnesia Haze? Please help to make this database better and upload/connect your information here!